All players should report to the tournament desk at least 15 minutes prior to your match time. If courts are available prior to the 8am round, teams may warm up until 7:30am. All players must vacate the courts at 7:30am. Throughout the rest of the day, warm up courts are not available (empty courts may not be used). If teams want to warm up, it is recommended to find some nearby courts. Always use the restroom before you report to the desk. Do not wait until match is called to use the restroom. You should be ready to take the court as soon as you are called (i.e. shoes, sun screen, etc. all taken care of). Captains should submit lineup cards at least 15 minutes prior to each match. NOTE: Never turn in a lineup card until all players are on-site and ready to play. NEW FOR 2017: If a team submits a lineup with any lines defaulted, the opposing team will be allowed to receive their lineup back, be notified which line(s) is/are being defaulted, and make any changes to their lineup. Strictly enforced 10-minute warmup before each match. NOTE: There is not a break once the warmup is over. Play should begin promptly. Required format: The format throughout this Championship is best 2 out of 3 sets, regular scoring with a 10-point match tie-break in lieu of the 3rd set. Should you reach 6-all in the 1st or 2nd set, you will play a tiebreak, first to 7 by 2, using the Coman procedure. Should you split sets, you will play a match tiebreak, first to 10 by 2, also using the Coman procedure. No more than 90 seconds on change overs. There is no rest period on the changeover after the first game of the 1st or 2nd set. A 2-minute break is allowed if you split sets. All players from the court need to come to the desk immediately to report scores. This is done to ensure that we get the correct scores and any discrepancies can be worked out at that time. Once all lines have been completed, captains need to come to the desk to sign the scorecard. NOTE: If this is forgotten, we will assume that the captain agrees to all scores as they were reported and the scores may not be disputed at a later time. 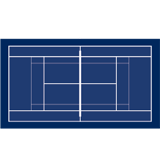 Team standings will be posted at the site, however, TennisLink will be used for official standings. USTA Certified Officials will be on-site. Please note that only players on the court should request assistance. Spectators should only ask for help if one of the players has requested it. Officials may observe courts from a distance or be on the court as they deem necessary. NO COACHING IS ALLOWED AT ANY TIME. We expect all players and spectators to abide by The Code of Tennis and display good sportsmanship. We are very fortunate to have the use of this facility for this event, so please help us keep it clean by picking up after yourselves. Please do not play on any courts that are not assigned to you and respect the facility’s rules. Non-members needs to be across the street at Safeway or Leyden Ct next to the club. No participants, other than CACM members, should be parking in either CACM parking lot. Non-members are not permitted in the clubhouse. As the tournament desk if you need hepl finding the restrooms.